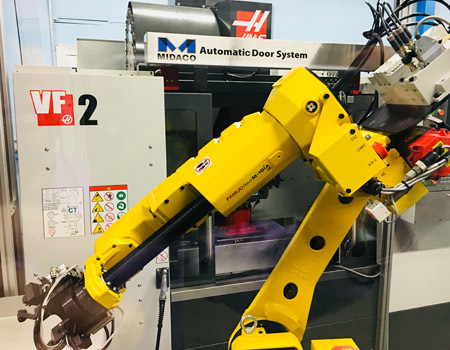 Robotic Machine Tending | Industrial Robot Integration - JH Robotics, Inc.
Any individual that has been in the business of manufacturing will tell you how labor intensive and even tedious it can be to tend a machine. By replacing this tedious and often dangerous task with a robot, you’re not only decreasing labor costs, you are increasing the productivity of your manufacturing process while making your workplace a safer place for your employees at the same time. Robots are able to work at a constant and truly repeatable rate which will increase productivity by roughly 10-15%. Now, think about the possibility of adding lights-out manufacturing to increase productivity even more – just think, you can be at home sleeping while your work force continues to operate through the night making your company more profitable while decreasing the risk of work place accidents. Pre-Engineered Machine Tending Automation Cells offer overall system cost savings with proven system designs. Optional Secondary Operations on your parts such as deburring, washing, inspection, marking/labeling, and final packaging. For certain applications, multiple machines can be tended using (1) robot system due to the 6-axis capability. Custom Machine Tending Solutions is what we do, so if one of our Pre-Engineered Machine Tending Automation Cells does not fit your need, we can work with you to create a system concept design to your liking. Custom part input and output solutions designed to suit the product being handled. Customization of end-of-arm tools to meet the application. 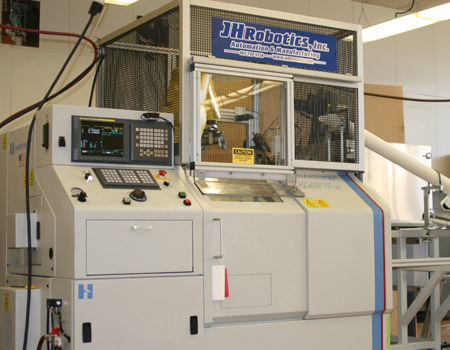 Based on the size and weight of your part to be handled, JH Robotics can recommend the appropriate robot model to suite your needs. There are many applications in a variety of industries where machine tending automation can greatly benefit the manufacturing process. Our experienced team of engineers, designers and integrators have the experience to successfully integrate machine tending robots into your manufacturing process. With over 30 years of experience in the robotics industry we’ve become the experts that manufactures rely on when it comes to automation. Call us today at 607-729-3758 or visit our online estimate form to get started on making your company more productive, more profitable, and running lean.